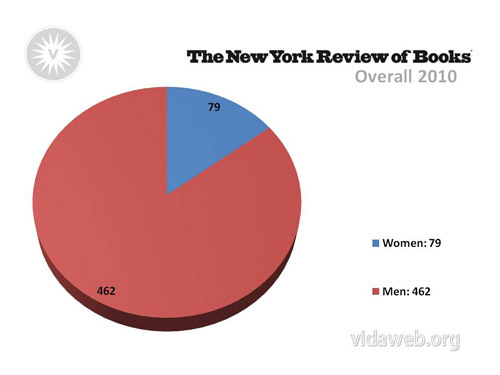 Now we can better understand why fewer books by women than men are getting reviewed. In fact, these numbers we found show that the magazines are reviewing female authors in something close to the proportion of books by women published each year. The question now becomes why more books by women are not getting published. The VIDA numbers provide a start toward an answer: Of the new writing published in Tin House, Granta,and The Paris Review, around one-third of it was by women. For many fiction writers and poets, publishing in these journals is a first step to getting a book contract. Do women submit work to these magazines at a lower rate than men, or are men’s submissions more likely to get accepted? We can’t be sure. But, as Robin Romm writes in Double X, “The gatekeepers of literary culture—at least at magazines—are still primarily male.” If these gatekeepers are showing a gender bias, there’s not much room to make it up later. So, what’s a female writer to do? Give up. Hardly. And, if the woman writer happened to go to Mt. Holyoke College (where women rule) and Wesleyan University (diversity and tolerance above all else), and be a breast cancer survivor, surrender is never an option. I will continue to write. I will continue to read. I will, however, push harder for my bookclubs to select books by female authors. Only female authors. And that feels wrong (remember, diversity and tolerance above? ), but it’s something, right? That will be my tiny rebellion for the cause. And yours? This entry was posted in Book Clubs, Gender Disparity in Publishing, Women Writers, Writers & Readers: Community Forum and tagged book clubs, Glimmer Train, Jodi Picoult, Mount Holyoke College, The New Republic, Tin House, Vida Count, women readers, women writers, writing by Pam Parker. Bookmark the permalink. There should be more female editors. What? No books with football or beer content? When I started my blog, I noticed 90% of my readers were female. I asked my daughter why and she said, “Daddy, it’s ’cause men don’t read.” Oh well.